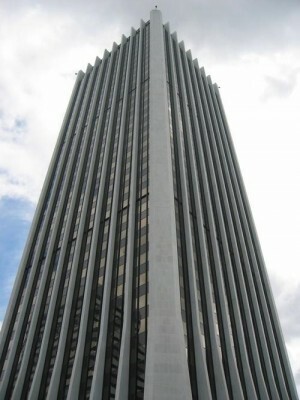 The Wells Fargo Center is an office building located in Portland, Oregon, United States. The tower rises 546 feet (166.4 m) with 40 floors of office space and three levels of parking below the surface. When the structure was completed in 1972, the center became the tallest building in the State of Oregon. The building and a connected four-story building were designed by Charles Luckman and Associates. It was dedicated on May 25, 1972. Originally known as the First National Center, the name was changed to the First Interstate Tower in 1981. The current name was adopted after Wells Fargo purchased First Interstate Bancorp in 1996. Upon opening in 1972, the Wells Fargo Center dwarfed all other existing high-rise developments in downtown Portland. 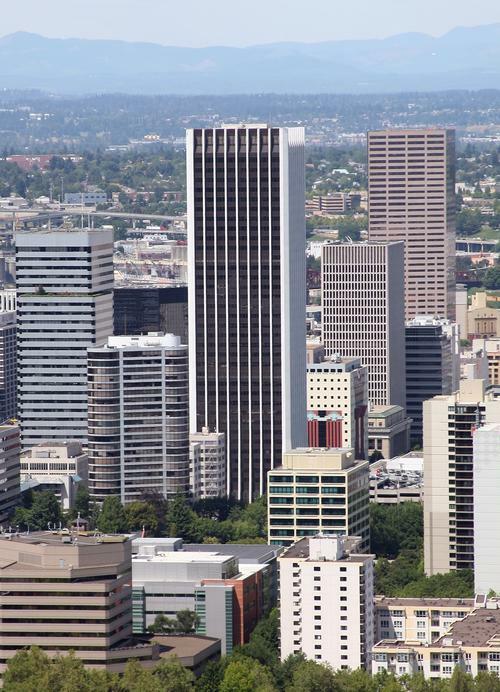 Public outcry over the tower's scale and the potential of new development to block views of Mount Hood led to height restrictions on all new development. The public areas went under extensive renovation in 2001 including room for more retail space. Renovations were completed in 2002 at a cost of $35 million. Focused on the lobby area, it included the addition of a display on the bank's history.